He came, he saw, he studied hard and overcame. But at the end of a long and winding road which started in the Democratic Republic of the Congo (DRC), he made it to UKZN’s College of Health Sciences Graduation ceremony where he received a Doctor of Philosophy in Health Sciences (Immunology) degree. Akilimali says he vividly remembers spending entire Saturdays in the library reading his Biology textbook and each day only getting through two pages as he had to constantly refer to a French-English dictionary. Then it was back to his room to face the reality of having no food. He made special mention of Ms Jenny Kerchhoff at the Language Centre on the Pietermaritzburg campus; Professor Colleen Downs of the School of Biology and Conservational Sciences, who provided him with a job which enabled him to buy food; his MSc supervisor Dr Victoria Kasprowicz, who coached him on how to write, and his PhD supervisor Professor Thumbi Ndung’u, who ‘taught me most of the science I know,’ he said. Akilimali and his family fled the DRC for South Africa because of violence there. This was a setback for him as he had to abandon his Geology studies which he was half way through. 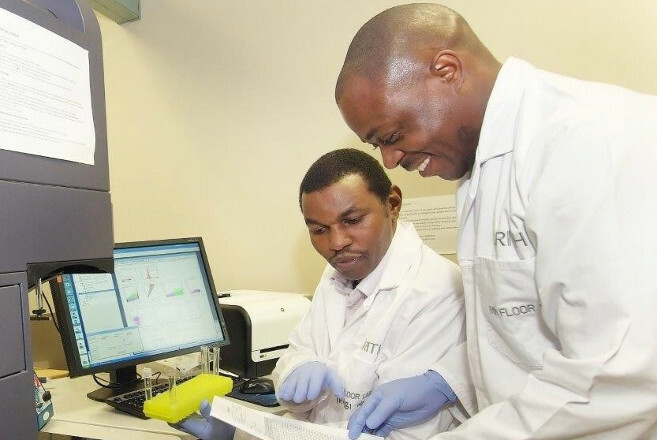 At UKZN he pursued a Bachelor of Science majoring in Genetics which he still enjoys as a post-doctoral Fellow at the Africa Health Research Institute (AHRI). His PhD study examined the Immunopathogenesis of Cryptococcosis-Associated Immune Reconstitution Inflammatory Syndrome (C-IRIS). This is a paradoxical clinical deterioration experienced by some patients with HIV-associated Cryptococcal-meningitis (CM) upon initiating antiretroviral treatment (ART). This is despite the fact that these patients are demonstrating signs of HIV clinical improvement such as the rise in CD4 count and decreases in HIV viral load. In hospitals around Durban it has been estimated that around 7.3% of these patients will die within two days of admission. The study aimed to identify biomarkers (measurable substances) that may discriminate the patient at risk of C-IRIS before initiation of ART treatment, suggest mechanisms of C-IRIS immunopathogenesis and point to possible clinical intervention in C-IRIS. These findings have the potential to improve clinical interventions and lead to better diagnosis of this condition.